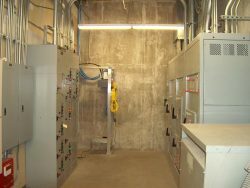 Since 2003, Keys Energy Services, Inc. has been your trusted commercial electrical contractor in Nampa & Boise, ID with experience in troubleshooting, installing and repairing electrical projects of all types, including commercial buildings, private medium voltage systems operations, 15kV loops, radio transmitter sites, apartment complexes and more. Contact us today regarding your electrical project and we’ll be happy to help. As your local commercial and industrial electrician in Nampa & Boise, ID, Keys Energy Services, Inc. has the experience and capabilities to provide professional and trusted service, no matter the scope of your commercial electrical project or the specific nature of the electrical service. We are confident that we will deliver safe and effective results. Why? Because for more than a decade we’ve been establishing our skills and expertise among commercial clients throughout the area. From office buildings to retail establishments to colleges and universities, our range of expertise is simply unparalleled, with a strong portfolio of projects and satisfied customers to back it up. As a specialty commercial and industrial electrician in Nampa & Boise, ID we provide a full gamut of services—both standard and specialty. Call us for commercial installations, replacements, repairs, maintenance and troubleshooting. What sets us apart is our ability to further take on projects such as private medium voltage distribution work and radio transmitter sites. We’ll tackle the tough jobs, and we’ll do it with a superior degree of workmanship and confidence. Call us for work on lights, panels, generators, wiring, arrays, switches, breakers and more. We promise we’re the only commercial and industrial electrician you’ll ever need to call, no matter what the job entails. Fully licensed and insured for your safety and peace of mind. Capable of doing 15kV work! Backed by more than 40 years of professional, hands-on experience. Equipped to work on installations of all types, across a wide range of industries. Accredited with the Better Business Bureau (BBB) and maintain a superior rating. When you need expert electrical repairs and service, done to the highest levels of safety and excellence, trust Keys Energy Services, Inc. Contact us today regarding your project.